The bumchin badboy is back, and he's packing a platter of greasy riff pies. But be lively, these are so fresh they're jumping off the plate! "High Frequency" is all about the ping pong ball bassline that ricochets around the mix like a hyper puppy who's been given grown up Pedigree Chum while "Entity" adds instant contrast with grumpy bass guffs and a beat the rolls with absolute perfection and works in pretty much every single mix we've tried. 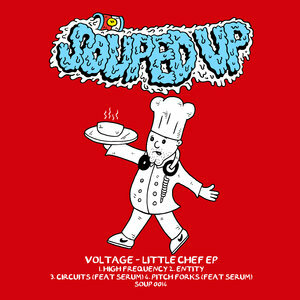 Deeper into the EP we find Souped Up's head chef Serum getting in the mix for two collaborations; "Circuits" is a proper grumpy one with just a smidgeon of BC peppering the mix while "Pitch Forks" gathers the rabble and comes charging out of the gate towards whoever's made the most recent public upset. And by the sounds of that flabby bassline and those graveyard pads they're not stopping until blood is split. Rabble rabble!